The wife of a certain always-late rabbit is not pleased with her domestic situation. Scowling ferociously throughout at her oblivious mate for charging off and leaving her to run a busy household, Mrs. Rabbit introduces the offspring—from eldest daughter Beatrix, currently set upon becoming a supermodel, to baby Emily, “the spitting image of her father: she bawls the whole blessed day”—while fulminating about certain unwelcome guests like the girl who keeps changing size. Her diary entries accompany a set of magnificent, extravagantly busy scenes festooned with exactly drawn bric-a-brac, visual jokes, and Carrollian characters. Artistic tours de force like the 100 (!) different carrot dishes, each one labeled, that Mrs. Rabbit offers weight-obsessed Beatrix and a classroom stocked with familiar figures from the Dodo to Tweedledee and Tweedledum make delightful poring-over. 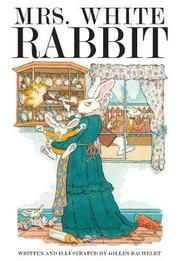 Some of the humor takes satiric or ribald turns (“My little Eliot sometimes seems to be quite advanced for his age,” Mrs. Rabbit notes, rushing in to stop the tyke from peeking under a doll’s dress), broadening the audience and offering chuckles to adult readers. All of the lagomorphs except teacher Mrs. Hare are, like the few human characters in the rest of the cast, white.